This simple motif is easily customized, making it a great go-to pattern. 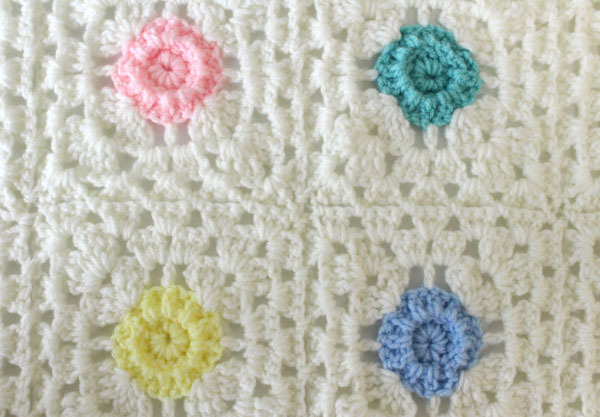 This version includes pastel circles against white for a colorful baby blanket. Front Post Double Crochet (FPdc): Yo, insert hook from front around post of next st from previous row. Yo and draw up a loop around post. *Yo and draw through 2 loops. Repeat from * once. Spike Half Double Crochet (sp hdc): Yo, insert hook in next skipped st from previous rnd, yo, draw up a loop to height of current rnd, yo and draw through 3 loops. 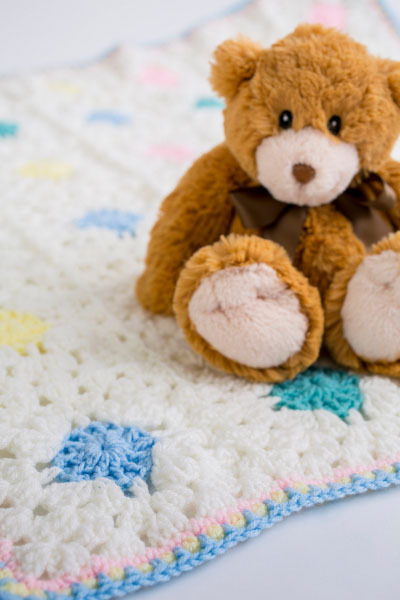 After the first square is crocheted, each additional square is joined to the rest of the blanket in the final round. 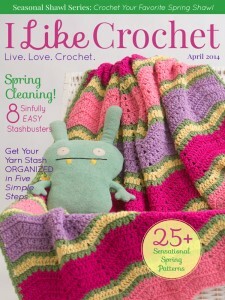 A 3 round border is crocheted around the entire blanket after assembly. Ch 5, join with sl st to first ch to form ring. Following color placement chart, join MC as for first square. Follow instructions for first square through Rnd 4. Following color placement chart, follow instructions for joining additional squares (Row 1) for to attach first square of each row to prior row. Following color placement chart, follow instructions for joining additional squares through Rnd 4. Rnd 1: With RS facing, join CA with sl st in any corner ch-2 sp, ch 1, 2 sc in same ch-2 sp, *sc in ea dc and ch-1 sp across side,** (2 sc, ch 1, 2 sc) in corner ch-2 sp. * Repeat from * to * twice more, then from * to ** once, (2 sc, ch 1) in first ch-2 sp, join with sl st to first sc, fasten off. Rnd 2: With RS facing, join CC with sl st in any corner ch-1 sp, ch 1, (sc, ch 1, sc) in same ch-1 sp, *ch 1, sk 1 st, sc in next st** around to next corner ch-1 sp, (ch 1, sc) twice in corner. * Repeat from * to * twice more, then from * to ** once, ch 1, join with sl st to first sc, fasten off. Rnd 3: With RS facing, join CD with sl st in any corner ch-1 sp, ch 1 (sc, ch 1, sc) in corner, *ch 1, sk 1 st, sp hdc in next skipped st from Rnd 2,** around to next corner ch-1 sp, (ch 1, sc) twice in corner. * Repeat from * to * twice more, then from * to ** once, ch 1, join with sl st to first sc, fasten off. Under ‘downloads’ there is no document to download.